Board index ‹ SEPTEMBER CLUES AND 9/11 ‹ SEPTEMBER CLUES: the 9/11 psyop exposed: the media aired a "Made-for-TV Hollywood movie"
Getting my mind around the twin towers? I cant seem to connect the dots on the demolition of the two towers. Do we think that missles hit the towers, and then they were brought down from the bottom first? If so why didnt people see them come down like we saw building seven come down. Or was there a major smoke screen first, and then the demolition. We all know they didnt come down, top first. Re: Getting my mind around the twin towers? truthseeker wrote: I need help. The towers, emptied out of people, were brought down by traditional demolition and in the safest way possible in order not to damage the surrounding buildings out of the WTC complex. This event was not showed to the public. Nobody outside of those involved in the scam has seen the actual towers falling. Not from up close, anyway. Everything else was faked (planes, burning towers, falling people, drama etc). No fires. No missiles. No extra bombs, etc. Probably fake billowing smoke and possibly fake explosions to simulate from afar the points of impact. Now, why did they not fake a more "credible" spectacular falling down of the towers, showing them in pieces, crashing down on other buildings? Because such effects had to be reflected in the reality of Manhattan! But since no buildings had really to be damaged outside the WTC complex scheduled for demolition, they had to invent a ridiculous collapse that looked like the odd, dramatic result of the planes impact and fire, and yet showed the towers falling on their footprints without damaging anything else. Now, imagine seeing all the way from New Jersey or Brooklyn the towers being brought down by traditional demolition. I believe many must have glimpsed something of this event (that very likely happened in sync with the fake images of the collapse showed on TV). But what, exactly? Because traditional demolition starts from the bottom, not the top, you would simply see the height of the towers diminishing before your eyes, and disappearing into a billowing cloud of smoke and dust. Now, not incidentally, the fake videos of the pancake collapse are still consistent with the image of the towers diminishing in height, and thus they can be superimposed in people's minds with what they might have glimpsed from afar and trough the smoke probably deliberately risen to cover up the most of the scene. TV did the rest by telling everyone what they had seen. nonhocapito wrote: Re: Getting my mind around the twin towers? I get all you posted! I wonder if we will ever "connect" ALL the dots? a. Actual innocents that were killed. b. Possible deaths of any passengers that MIGHT have been loaded onto an airplane. If so where are they now? Dam so many unanswered questions, which i guess is why were here. nonhocapito wrote: Now, imagine seeing all the way from New Jersey or Brooklyn the towers being brought down by traditional demolition. I believe many must have glimpsed something of this event (that very likely happened in sync with the fake images of the collapse showed on TV). But what, exactly? Although it seems like the conclusion making the fewest assumptions, knowing what we know at this point (occams razor), this conclusion still bothers me. Why create a fake-truth movement complete with architects and physicists around the traditional demolition hypothesis? I'm pretty sure you agree with me that most members of the mainstream truth movement are being extremely dishonest and misleading, so aren't they being dishonest about the method of destruction? The 3 buildings that vanished on 'ground zero' where immense and constructed in a redundant and extremely sturdy matter. In any case it must be the largest controlled demolition ever attempted. I'm still skeptical that it could have been achieved with anything like conventional demolition-cutter-charges. disinpho wrote: The 3 buildings that vanished on 'ground zero' where immense and constructed in a redundant and extremely sturdy matter. This is correct and the three buildings could therefore not 'collapse' into a heap of rubble due to some small fires up top or somewhere. Anyone suggesting that sturdy buildings with plenty redundancy suddenly can 'collapse', e.g. from top down, is a simple terrorist. Can anyone estimate how much rubble there should be after the collapse of two 110 story buildings? That is, should the rubble pile be, say, 10 stories high? Twenty? More? disinpho wrote: Why create a fake-truth movement complete with architects and physicists around the traditional demolition hypothesis? I'm pretty sure you agree with me that most members of the mainstream truth movement are being extremely dishonest and misleading, so aren't they being dishonest about the method of destruction? truthseeker wrote: I get all you posted! a. Have you ever heard of any that didn't turn out to be faked? b. What passengers? What plane? The sleigh of Santa has more chances to be real than planes on 9/11. lux wrote: Can anyone estimate how much rubble there should be after the collapse of two 110 story buildings? That is, should the rubble pile be, say, 10 stories high? Twenty? More? There is information on the 'net as to what construction materials went into building the towers [certainly wtc1&2 not sure about wtc7]. Therefore going on the premise of 7850kg/per cubM of steel and approx. 2t/per cubM of concrete you could take a fair guess at the expected rubble pile. Unfortunately, with the 'collapse' falling into the basement levels it would seemingly be unclear as to if the rubble pile was 'reflective' of those 'intact' buildings having actually collapsed the way we are told. One thing that comes to mind which always puzzles me is the paper. How is it that people do not seemingly show or have on the internet copies of 'interesting' letters/pages that they came across that day. No letters of appointment about to be sent out that morning to a new starter. No letters of so-and-so about to be fired. No statements of such-and-such company having so much money in assets. I am pretty sure anything you found on that day [if you were allowed in near the inner sanctum so to speak] would be classed as 'windfall' and not necessarily subject to some of the laws of privacy [any lawyers reading that could throw some light on this issue?]. Another thing, which others have pointed out, is the distinct lack of anything resembling an office. What about the number of photocopiers there would have been? Safes? [I've worked on building sites which contain heavy duty/fire-resistant safes but we are talking pre-eminent offices from downtown Manhattan here!]. Steel filing cabinets which are usually fire-proof. Carpet! Have you ever tried to destroy 'Axminister' carpet? To say that no missles were used is a strange statement? Let us consider that Simon suggested in "Sep Clues", that there could have been missles. I believe that is what was stated? I thought the moon landing movie was better even after 32 years of improved technology. truthseeker wrote: To say that no missles were used is a strange statement? That's true, in part, and I believe this forum records somewhere myself asking the same thing a while ago. I think that the missile is a possibility that Simon rightfully considered. Above all it demonstrates that, even if the witnesses had been reliable, it was still possible to fool them and make them believe they were seeing a plane. The idea of a missile is also helpful because it makes us see how things can be staged, in so many ways. Nowhere Simon states that this is how it went or that there is any proof of this. It is simply a possibility and as such it was right to consider it. As I said, ultimately we don't know how exactly it all happened in all its aspect. I tend to believe there was no missile because ultimately there was no use for it. Why running a risk? Witnesses can be faked, and putting things in can be more dangerous than leaving things out, when you control the media and can fill up the story with all the inventions you want. I tend to (agree) that no missles were used at all. What if a missle launch had a "flare out"? the most reliable script avilable to pull the caper. industry not that long afterwards. Could he be ridden with guilt? A side note. When Aaron Brown left CNN they owned him for sometime. This is a quote from his bio. "Brown was under contract with CNN until June 2007, which prevented him from doing interviews or returning to television". (http://en.wikipedia.org/wiki/Aaron_Brown) Just a thought. A certain professor Z. Bazant of Northwestern University, Evanston, IL, has written many peer reviewed, scientific papers about this and he says that the average density of the total volume of the intact buildings, tops C and bottoms A, incl. everything was 0.25. It means that the weight of one cubic meter of the building was 250 kilograms. To be compared with one cubic meter of water that weighs 1000 kilograms. You can conclude that the buildings were quite light as they contained mostly air. 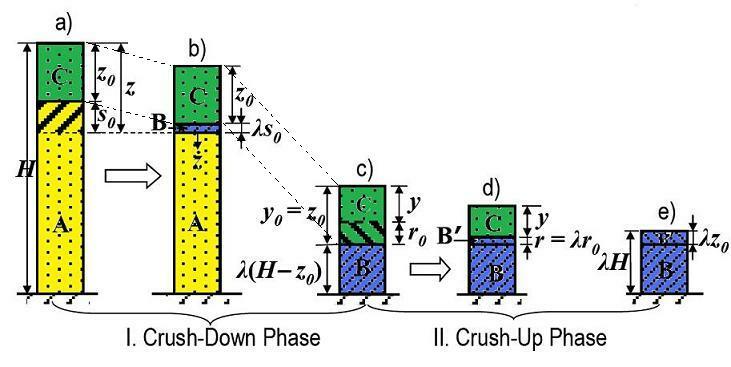 Same professor, a stupid terrorist in my eyes that US Dept of War should imprison at Guantanamo at once, suggests that the average density of the rubble B of the buildings after 'collapses', when top C compress bottom A and itself C into rubble B, is 1! One. that then becomes a pyramid of rubble B - same density - with bigger bottom foot print and less height. The US Journal of Engineering Mechanics, JEM, has published a scientific analysis by me - http://heiwaco.tripod.com/blgb.htm - of this strange phenomenom! Return to SEPTEMBER CLUES: the 9/11 psyop exposed: the media aired a "Made-for-TV Hollywood movie"